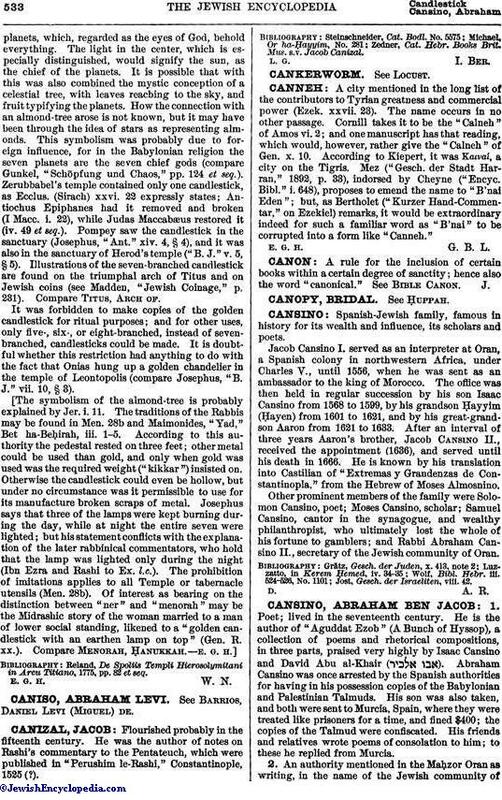 Spanish-Jewish family, famous in history for its wealth and influence, its scholars and poets. Jacob Cansino I. served as an interpreter at Oran, a Spanish colony in northwestern Africa, under Charles V., until 1556, when he was sent as an ambassador to the king of Morocco. The office was then held in regular succession by his son Isaac Cansino from 1568 to 1599, by his grandson Ḥayyim (Ḥayen) from 1601 to 1621, and by his great-grandson Aaron from 1621 to 1633. After an interval of three years Aaron's brother, Jacob Cansino II., received the appointment (1636), and served until his death in 1666. He is known by his translation into Castilian of "Extremas y Grandenzas de Constantinopla," from the Hebrew of Moses Almosnino. Other prominent members of the family were Solomon Cansino, poet; Moses Cansino, scholar; Samuel Cansino, cantor in the synagogue, and wealthy philanthropist, who ultimately lost the whole of his fortune to gamblers; and Rabbi Abraham Cansino II., secretary of the Jewish community of Oran. Jost, Gesch. der Israeliten, viii. 42.